Rock phosphate it is also known as Phosphorite, phosphate rock.it is a chemical compound and it is in Ecru colored powder foam. Storage: Keep container tightly closed. Keep container in a cool, well-ventilated area. 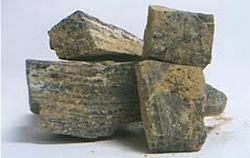 We are engaged in manufacturing and exporting a wide range of products like phosphate rock. Grades available (p2o5) 28% & 30% any, any other specs required. Rocks manufactured from Steel. Used in Colleges, Homes, Hotels, etc.